Head to View conference in Turin for a great speaker lineup. View Conference in Italy takes what looks like a standard animation and VFX conference and makes something special with it. Not content with simply drawing in a few top notch artists to talk for an hour or two, View surpasses expectations with a speaker lineup that many events could only dream of. From Keynote speaker Hans Zimmer (yes, really) who has had a profound impact on anybody with an interest in film (we all know sound plays a huge part), to nine-times Academy Award Winner, Dennis Muren, to Rob Bredow of ILM, everywhere you look you will find the very best of the industry. The organisers have outdone themselves, not only with top keynote speakers but in every other area of the event, including the venue, which has moved from its traditional home to the Official Grandi Riparazioni – a fitting location for this year's amazing content. No conference would be complete without talks, but sometimes the keynotes can be a bit dry. View is set to buck that trend with some amazing talent talking about their passions and showing off elements from some of the biggest projects in recent times. As well as the names already mentioned, Oscar winner John Gaeta will be talking about the Magicverse; Bafta and VES award-winner David Vickery will be delving behind the scenes on Jurassic World: Fallen Kingdom; Troy Saliba and Aharon Bourland will be discussing the VFX of Venom; and Netflix director Phil Rynda will be looking at character before design. There are too many to list here, so take a look at the rest of the stellar talk programme to see what is on offer. Give your skills a boost with View's workshop programme. As much as a dose of inspiration can set you on the path for your next project, it's important to remember that learning the right skills – either to spread your wings, or to become more efficient at what you do – is vital to become a better artist. View has long had a workshop programme and 2018 (the 19th edition of the conference) sees the level of teachers and content lifted to new heights. Highlights of the programme include Pixar Effect Supervisor Bill Watral, who will be teaching you how to find the balance between realism and stylisation, and Danielle Feinberg, the DoP on Coco, will be running a workshop on visual storytelling, including a look at the visual nuggets you didn't realise you were seeing. In the masterclass section, you will find a whole host of topics covered from animation and characters with Carlos Baena, incredible developments of Renderman with Dylan Sisson, Cinema 4D R20 for Guerilla VFX with Helge Maus, and many more. 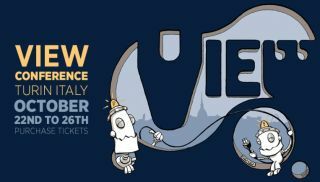 View is far more than talks and workshops, as it is also host to a recruitment fair that includes portfolio reviews, a games development programme, and the View Award, celebrating the best in CG/VFX from any level. For more on View Conference head over to the official site, where the full programme and details of all speakers can be found.